I love First Avenue. It’s my downtown danceteria even if I don’t dance. But this is not a fangirl post. It’s about email marketing. Like you, my email inbox clogs up with messages I’ve opted in to. I subscribe to Teresa Boardman’s real estate blog just because I like her photos. Business news comes from Fast Company’s Co.Design, and concert news from First Avenue. You get the picture. I get a lot of email. Admittedly, I scan them from my preview pane. Most I delete. I opened today’s missive from First Avenue, On Sale This Week because I saw the word “December.” No that’s not a band. It just means local band holiday shows are coming soon. I’m hoping Trampled by Turtles will play in town because the Dakotas (and the U.K.) are just too far away. 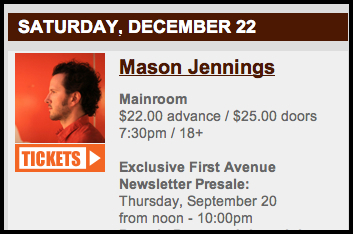 Tomorrow everyone can buy tickets to Mason Jenning’s December 22nd show. But today, me–I’m special. I have the secret code. I could buy tickets at noon today! Well maybe I’m not all that special, because I’m sure I’m not the only email subscriber of First Avenue’s concert preview. But I still feel special. I feel important. I feel thankful and appreciated. Why? In addition to the value of the news; I’m getting first dibs on tickets to a concert that will surely sell out. Your opted-in customers are loyal and valuable; don’t take them for granted. Test messages in your email campaigns. Do you get more clicks due to placement? or does content rule? What do your customers value? What offer will make them act?